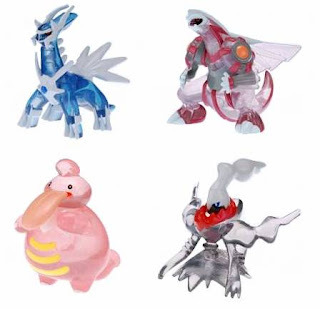 Bandai Pokemon Kids series DP4, released 15 figures at 17th July. Bonsly is re-printed. Updated summary list of released figure, refer to Pokemon DP figure release summary. On Japanese calendar, we will in early autumn soon, but still in late summer actually. Would like to introduce two kind of beach balls, Pikachu figure (mascot) in the ball. Left one was released in 1995, size:30cm (11.8"), hard to find recently. Right one is current, size:40cm (15.7"). Bandai Pokemon Super Get Series 11, will release 10 figures of Pokemon DP in November. Updated summary list of released figure, refer to Pokemon DP figure release summary. Bandai Pokemon Super Get Series 10, will release 10 figures of Pokemon DP at 11 October. Will post the photo later. Updated summary list of released figure, refer to Pokemon DP figure release summary. Seven & I Holdings Co.,　Ltd. have started 'Pokemon Fair' in every summer. 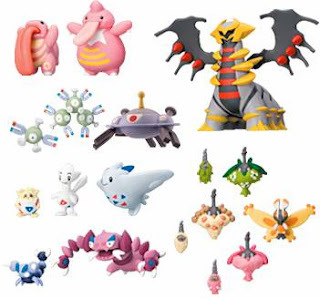 In Pokemon Fair 2007, Tomy released 2 limited figures, designed by Seven & I. It was available at stores of Seven-Eleven and Ito-Yokodo, not ordinary toys stores. First is Pikachu clear version, second is Piplup new pose, shown in the following photos, right figure is Seven&I. 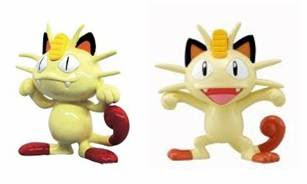 Tomy will renew 2 figures, Meowth and Flareon at 21 October. A right left figure in the following photo is current one, the left right is renewal. Vaporeon and Jolteon will be renewed in November. Venusaur, Charizard and Blastoise will be in December. Tomy will introduce 18 pcs figures box set at 26 October. It includes previous released Diamond Pearl figures and 2 new one. 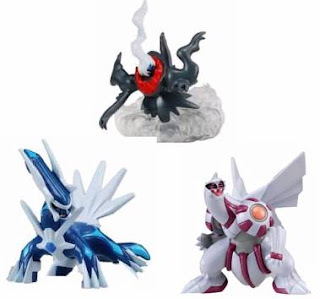 Dialga, Palkia and Darkrai figures are 'Battle Scene'. Garchomp and Carnivine are prior release. As for single release, Garchomp : February, Carnivine : March 2008. Tomy Monster Collection Series will release 2 figures of Pokemon DP at 21 October. Updated summary list of released figure, refer to Pokemon DP figure release summary. 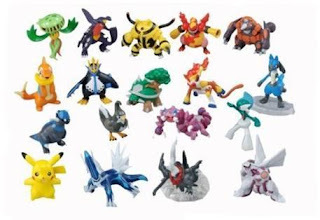 Tomy then introduced 18 pcs figures box set, all of figures are Legendary Pokemon. Legendary Pokemon can be seen in 1st to 10th Pokemon movies as plot. Figures in the box have special glossy painting (pearly color) as compared with ordinary figures. Deoxys is presented to your Diamond Pearl game with movie advance ticket. As for Deoxys figure, there was a box set, it was included 3 figures (normal, attack and defense). And we could find and get only normal form in the market. 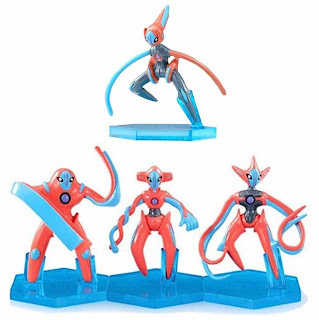 In July, Tomy renewed 4 forms of Deoxys figures, normal, attack, defense and speed individually. Bandai Pokemon Kids series DP5, will release 15 figures at 16 October. As for Cherubi, it will be same designed (pose and color) as Pokemon Kids 10th Anniversary Box set, Buneary will be new one. Updated summary list of released figure, refer to Pokemon DP figure release summary. As usual Tomy introduced 4 clear version figures for new movie. They were available at the movie theater only. A new Pokemon movie is released in July 2007, Dialga VS Palkia VS Darkrai. On the other hand, Tomy introduced new 3 figure series, named Battle Scene. Tomy then produced them. The following 1st photo is Monster Collection (MC) previous released one, 2nd photo is Battle Scene. Size is same as Tomy MC series, 2 inches. The series will be continued, next is Torterra, Infernape and Empoleon, coming in middle of November. 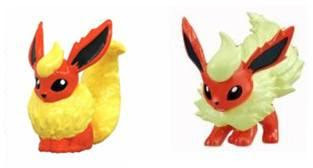 Yujin 3D Pokedex Series DP05, will release 9 figures (DP) and 5 figures (previous) in end of September. Updated summary list of released figure, refer to Pokemon DP figure release summary. 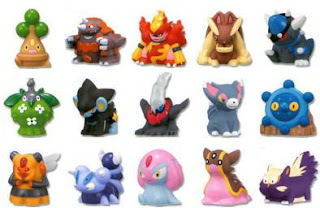 If want to see other Zukan series, please refer to Pokemon Yujin 3D figures. Bandai Pokemon Super Get Series 9, will release 11 figures of Pokemon DP in beginning of September. Updated summary list of released figure, refer to Pokemon DP figure release summary. Tomy Monster Collection Series will release 2 figures of Pokemon DP at 16-September. Updated summary list of released figure, refer to Pokemon DP figure release summary. 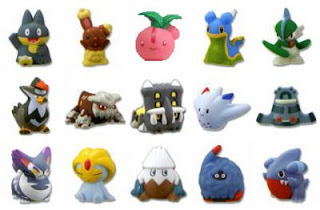 New Pokmon plushies were introduced by Pokemon Center in March to June 2007, size is approx. 4.7-5.2" height, palm top size.